A smallholder organic vegetable farmer in the Lao PDR. 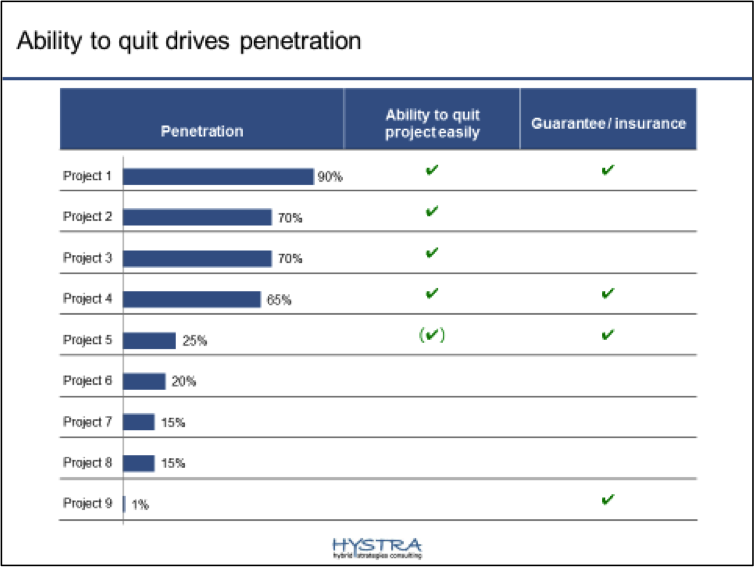 In October 2015, Hystra published Smallholder Farmers and Business, a report comparing the performance of 15 pioneer companies and organizations that have sustainably increased the income and livelihoods of millions of smallholder farmers around the world by sourcing produce from them or selling products to them. Working with smallholders is tough but the 15 organizations assessed in this report have found ways to overcome the numerous challenges involved to create real impact. During ADB’s 2nd Inclusive Business Forum for Asia in Manila, which explores inclusive business in agriculture in two key sessions, I’d like to share important selected insights drawn from the report. Farmers can increase their net yearly income by 80 to 140 percent when they have access to productivity-enhancing technologies such as improved seeds, micro-irrigation systems or hybrid cow breeds. In contrast, interventions focusing exclusively on ‘fixing’ dysfunctional markets and redistributing value in the supply chain—such as replacing informal traders, improving market access and passing on price premiums—only increased farmers’ incomes by between 20 percent and 60 percent. Providing technologies also puts farmers in the drivers’ seat: it empowers them with the means to improve their productivity and income. In turn, larger and more successful farmers are in a better position to negotiate prices, access and contracts. Much has been written about smallholder farmers’ risk aversion when considering new practices and technologies. 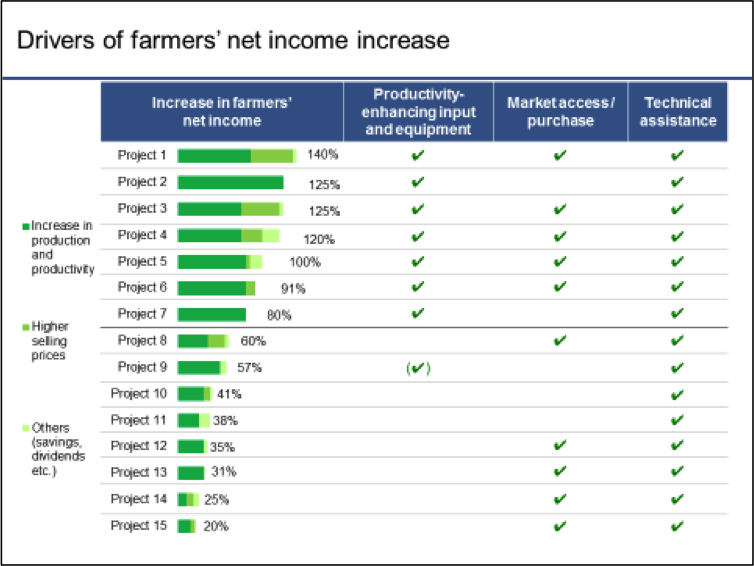 However, when looking deeper into what drives farmers’ adoption rates, what matters is not the size of investment required, the attractiveness of possible returns or the provision of guarantees. Instead, it is the reversibility of their decision. Organizations and companies that struggle to reach small farmers typically offer ‘one-way-tickets’, which means that it is difficult for farmers to change their minds about the product or service they have adopted if it is not successful. In contrast, organizations that enjoy rapid and widespread adoption typically avoid engaging farmers in long-term commitments, which leaves them free to return to their previous practices at little or no cost. One example relates to offering farmers to switch from maize to soya for a season (or as long as soya brings higher prices) – versus investing in cocoa seedlings, which take years to become productive. As the table above illustrates, insurance alone does not effectively address farmers’ concerns. When launching a new project, it seems intuitive to focus on enrolling the larger and more successful farmers first. They have the means and chances to succeed, while smaller farmers are more vulnerable to failure. However, the ideal early adopters are those in the 'enlightened middle' – farmers resilient enough to invest in new practices, crops and technologies, but not prosperous enough to be satisfied with the status quo. Ideally, these farmers are also used to engage with their communities (e.g. as teachers), which makes them likely to share their success with others. After the right early adopters are chosen, organizations should invest in their success through tailored and intensive support. For example, the BASF Samruddhi program sells quality inputs to soya farmers and supports them by providing intensive training to the first farmers it targets in a village for two full planting seasons. Demonstration and word-of-mouth from satisfied early adopters is a powerful tool for enrolling more farmers. Inversely, dissatisfied farmers are sure to spread bad publicity that will slow local expansion. Offering a wide range of benefits to farmers gives organizations and companies a unique competitive advantage, making them irreplaceable to farmers’ livelihoods. By becoming essential to farmers’ success, organizations ensure that farmers choose to work with them repeatedly. This creates a virtuous circle whereby both farmers and organizations invest more and more into each other’s success. One such example is JAIN, which began by selling micro-irrigation systems and expanded into complementary agricultural products and services. It now produces and sells improved seeds, purchases produce from contracted farmers at guaranteed prices, processes crops through its own factories, uses biogas digesters to power its factories, converts the waste into fertilizer and sells the fertilizer to farmers. This approach has benefited both JAIN’s 200,000 contracted farmers—many of whom have increased their annual incomes by between $500 and $4,000—and the company, which has increased its revenue while decreasing its operating costs. In 2014, JAIN had $1 billion in turnover. This blog is part of a series of blogs about inclusive business in Asia written by a wide range of experts in the run-up to ADB’s 2nd Inclusive Business Forum for Asia in Manila. Visit the new Inclusive Business in Asia site here.